Pavlo “Pasha” Antonenko is an Associate Professor of Educational Technology and Director of the NeurAL Lab in the School of Teaching and Learning. His research has been funded by state and federal agencies and focuses on developing, implementing, and studying technologies for scaffolding learning. His most recent project, “LENS: Leveraging Expertise in Neurotechnologies to Study Individual Differences in Multimedia Learning”, is a NSF-funded Science of Learning project that focuses on understanding learning with multimedia by a wide range of students including those with attentional and cognitive differences. 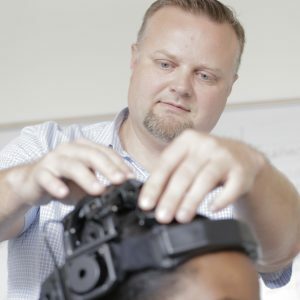 Dr. Antonenko has published in a number of educational technology and educational psychology journals and received several national and international awards for his research on the design of technology-enhanced learning environments and the implications of neuroimaging for educational research. He is the Educational Technology Strand Co-Coordinator for the National Association for Research in Science Teaching, Chair of the American Educational Research Association’s Special Interest Group in Instructional Technology, and a reviewer for multiple journals, conferences, and funding agencies. Research Excellence Award: Antonenko, P. (2007). The effect of leads on cognitive load and learning in a conceptually rich hypertext environment. Ames, IA. Best Conference Paper Award: Ryan, S., Jackman, J., Antonenko, P., Kumsaikaew, P., Marathe, R., Niederhauser, D., & Ogilvie, C. (2007). Student selection of information relevant to solving ill-structured engineering economic decision problems. Proceedings of the 114th Annual Conference of the American Society for Engineering Education. Honolulu, HI. Best Poster Award: Antonenko P. (May, 2003). Modern computing and modern education: Teachers using open source technologies. Presented at the International Symposium on Modern Computing in Celebration of John Atanasoff’s 100th Birthday, Ames, IA. Teaching Excellence Award Nominee (2003). Iowa State University, Ames, IA. Principal Investigator. iDigFossils: Engaging K-12 Students in Integrated STEM via 3D Digitization, Printing and Exploration of Fossils. NSF ITEST. Funded for $1,194,054. Principal Investigator. Project LENS: Leveraging Expertise in Neurotechnologies to Study Individual Differences in Multimedia Learning. NSF SL-CN. Funded for $765,000. Co-Principal Investigator. Building a Comprehensive Evolutionary History of Flagellate Plants. NSF GoLife. Funded for $2,233,768. Co-Principal Investigator. Development of a Simulation-based Application for Teaching Human Physiology through Guided Discovery, Pure Discovery and Authentic Research. NSF-IUSE. Funded for $247,129. Principal Investigator. EAGER: Collaborative Research: Cyber-Eye: Empowering Learning through Remote Visualizations using Unmanned Aerial Systems. NSF Cyberlearning. Funded for $58,145. Co-Principal Investigator. Converging Behavioral and Psychophysiological Measures: Evaluating the Effectiveness of Multimedia Learning Conditions with Dyslexic Learners. UF ROF. Funded for $98,206. Principal Investigator. NeuroSynch: Transforming the Assessment of Collaborative Problem Solving with Research on Team Neurosynchronies. UF CRIF. Funded for $49,823. Antonenko, P., Dawson, K. & Sahay, S. (2016). A framework for aligning needs, abilities and affordances to inform design and practice of educational technologies. British Journal of Educational Technology. Pengnate, S. & Antonenko, P. (2013). A multi-method evaluation of online trust and its interaction with metacognitive awareness. International Journal of Human Computer Interaction, 29(9), 582-593. DOI: 10.1080/10447318.2012.735185. Antonenko, P., Toy, S., & Niederhauser, D. (2012). Using cluster analysis for data mining in educational technology research. Educational Technology Research and Development, 60(3), 383-398. DOI: 10.1007/s11423-012-9235-8. Martens, J. & Antonenko, P. (2012). Narrowing gender-based performance gaps in Virtual Environment navigation. Computers in Human Behavior, 28(3), 809-819. Antonenko, P., Paas, F., Grabner, R. & van Gog, T. (2010). Using Electroencephalography (EEG) to measure cognitive load. Educational Psychology Review, 22, 425-438.